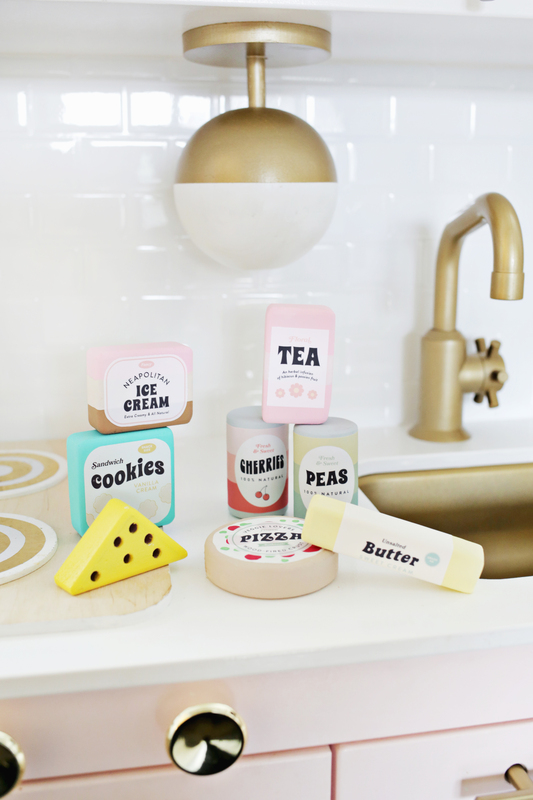 I am so so so excited to share today’s DIY with you. I have had this idea for a while, and am so happy I finally did it! 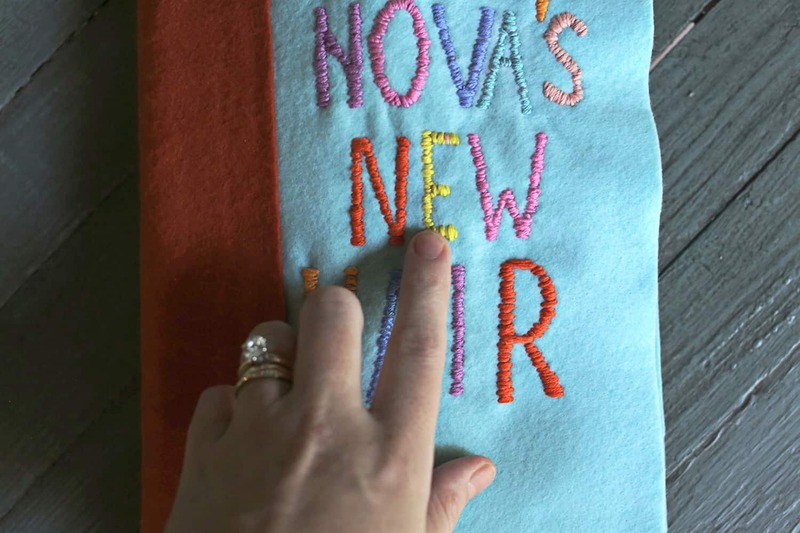 It was a good amount of work, but super FUN to do and one of the most sentimental DIYs I have ever made for Nova. 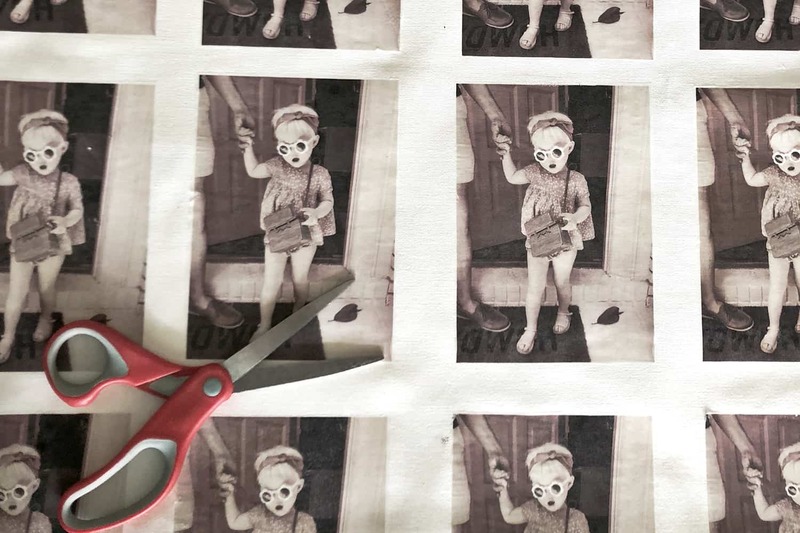 Today, I’ll teach you how to make your own homemade children’s book. This post is sponsored by Canon USA. I love my Pixma iP8720 soooo much and have used it daily for years. 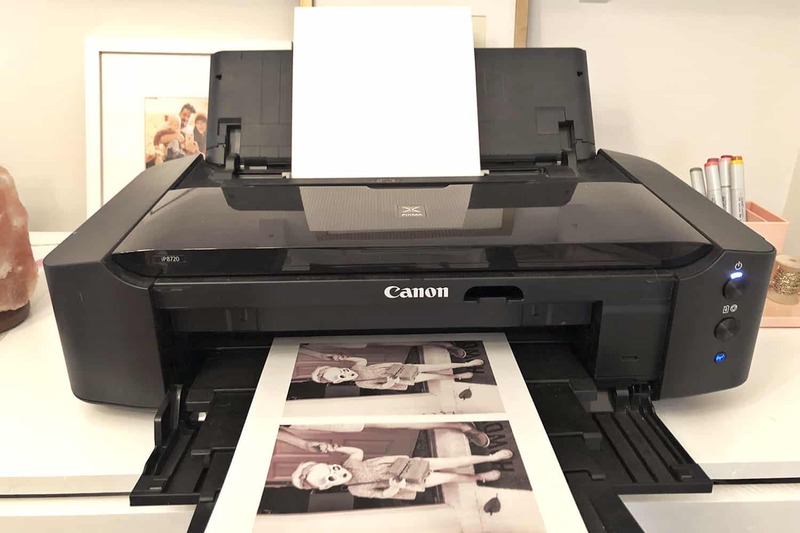 I use it for both large-format projects and smaller ones where I can print multiple photos on one sheet. For this project, I used iron-on printer paper and printed the same photo of Nova over and over again. I put 2 photos per sheet (5×7 inches each). After I printed all the photos, I cut them out and ironed them on canvas. The biggest key to getting perfect iron-ons is to wait until they are completely cooled to pull the paper away. Note: It is best to flip an image before you print it on iron-on paper as it will appear backwards after you iron it on. On this photo, I didn’t do that and the word (only halfway in the photo) on the door mat looks a little silly … but I wasn’t too worried about it since Nova can’t read yet. That said, if your project has any words or text on the image, you 100% need to flip it before printing. 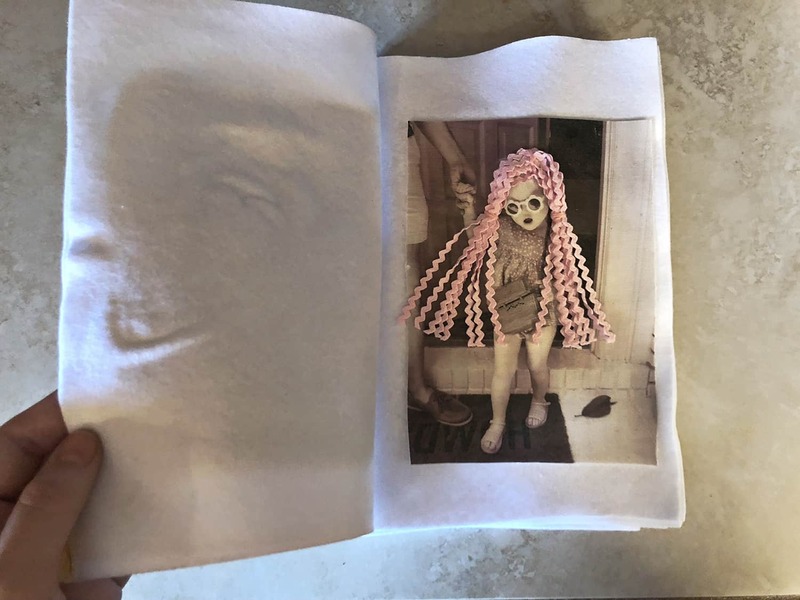 After that, I cut out each of the photos and began the process of hand stitching and glueing fun hairstyles onto each photo. This was SO much fun! I spent about three days on them. There are endless ways to add texture to the photos. 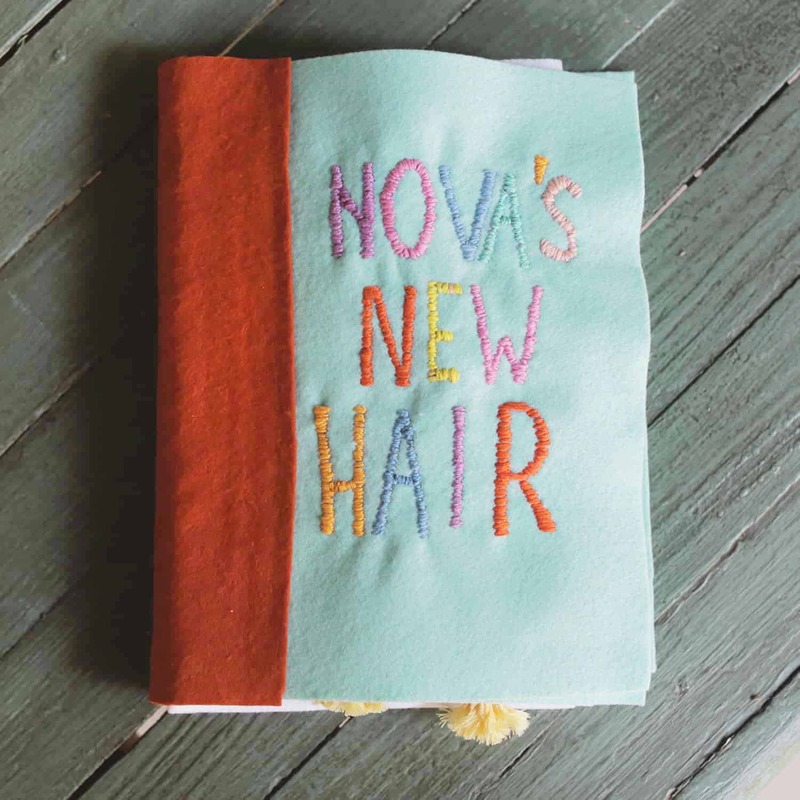 To customize your own book, you can totally make a hairstyle book like mine, but don’t feel limited to that! 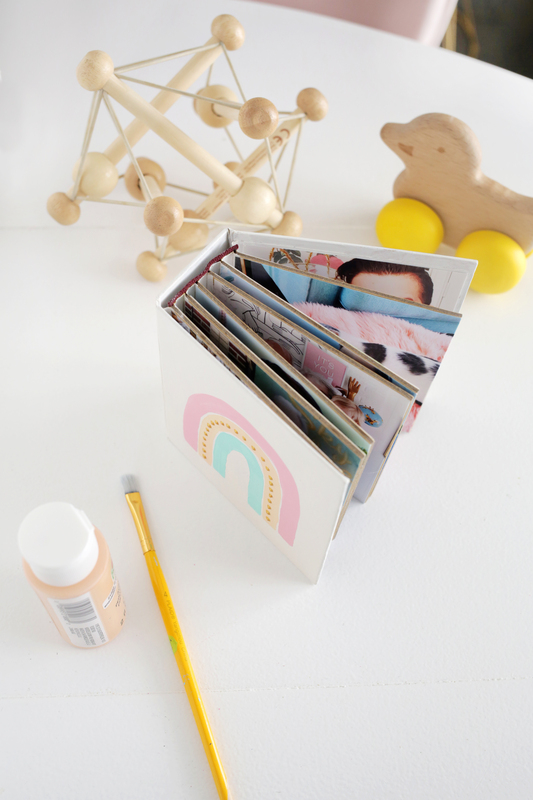 You can add textured details to ANY photos for a cute toddler-friendly book. 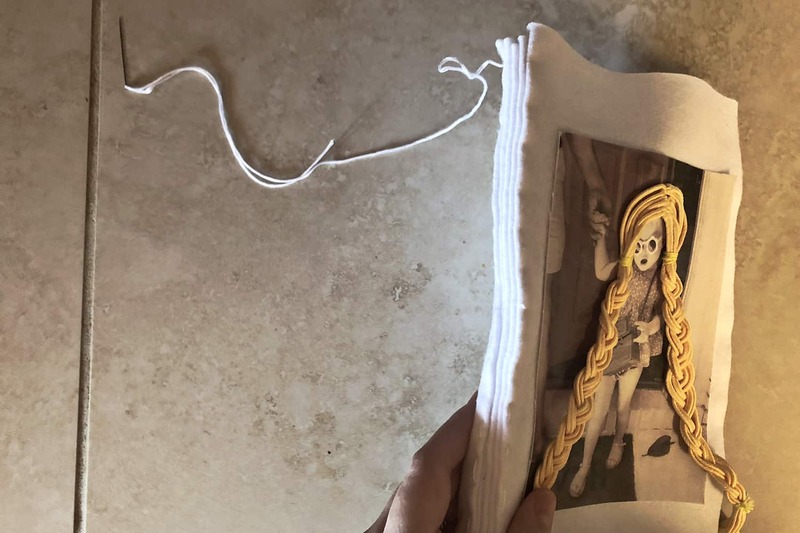 Then, I sewed together all the pages so they would be really secure inside of the book. Next, I added a front and back cover using felt and fabric glue. Last, I added a spine using a different color felt and fabric glue. Let it dry completely before adding a second round of glue to get it as secure as possible. I hand stitched the title, which took me around three hours, but I love the look of it so it was worth it. It could be done much quicker with a machine. 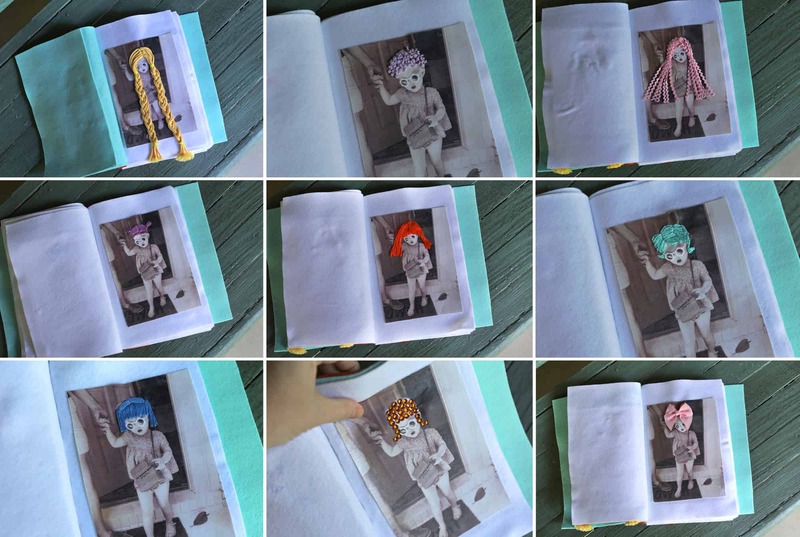 Here are the hairstyles inside the book. 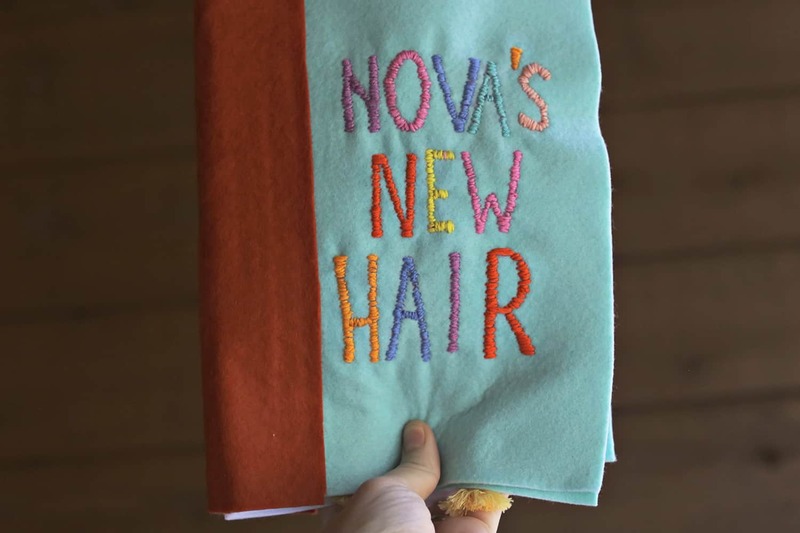 Nova thinks it is SO FUNNY and I had so much fun making it, so it was a win/win. 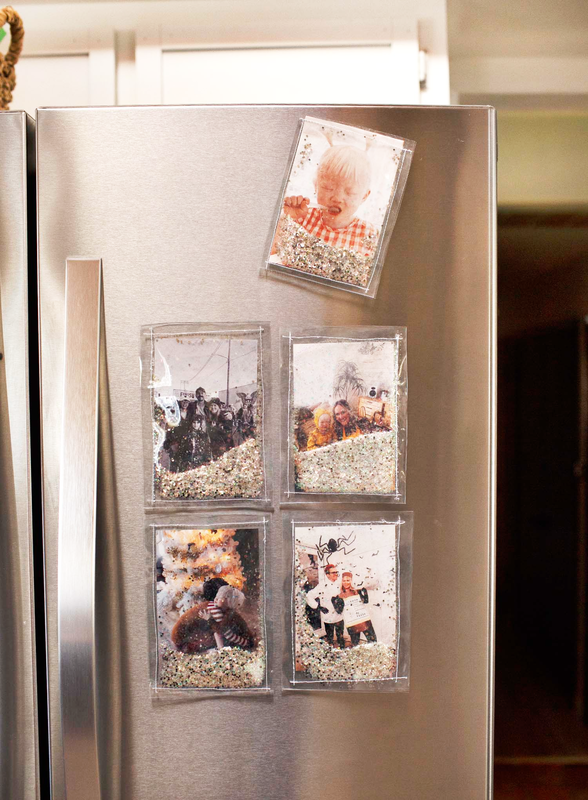 I love that this homemade project will be a part of her childhood memories and a keepsake she can keep later on. That is the cutest book ever! I love the faux hair with the pictures. I’ve been getting so many ideas lately from ABM on baby stuff. Thanks for this! I am TOTALLY doing this as a gift for my kids! I have a girl and two boys and would love to include all three in the book, they would get such a kick out of it! 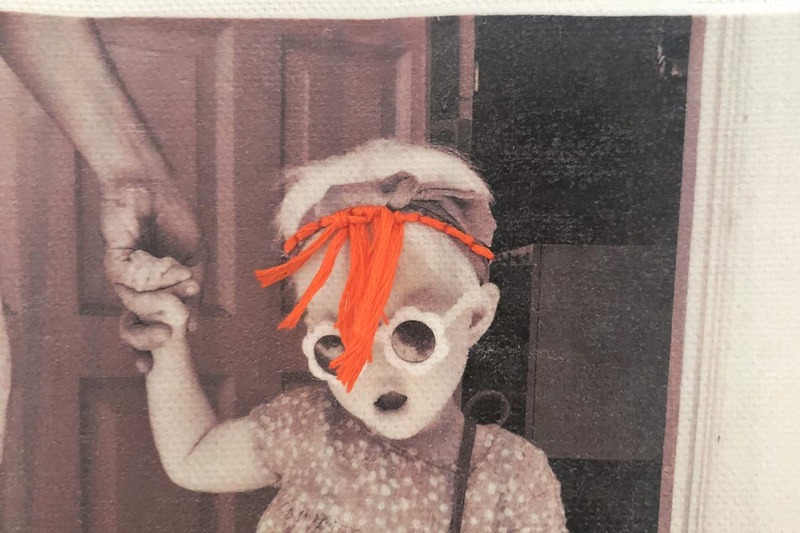 What type of canvas are you ironing the photo onto? Oh that is the cutest little book ever!!! Nova is adorable anyway, so this was a sure thing! 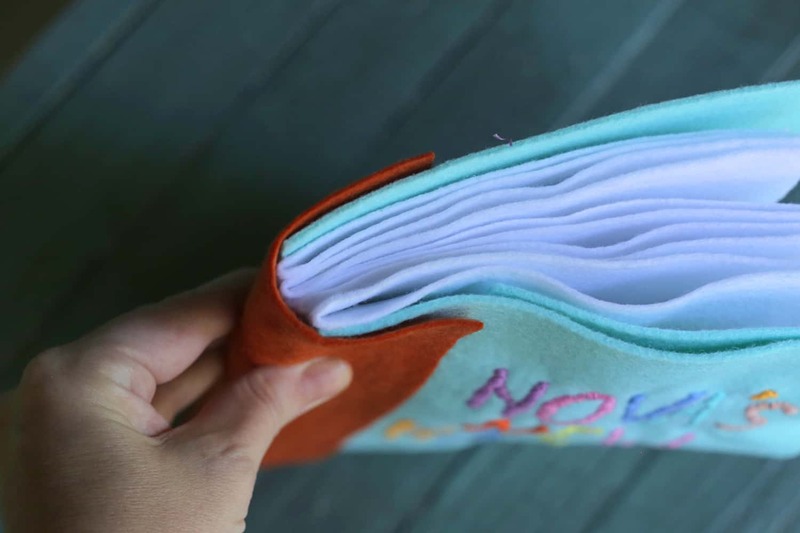 Oh my gosh, that is the CUTEST idea, and it turned out so beautifully with all the colorful handstitching! I don’t have kids or nieces or nephews yet, but I will file this away in my brain for the future. This is amazing! Best project I’ve seen on here in a while. My toddler would absolutely love this! This book is so cute! A treasure for sure that I am sure Nova will always love! 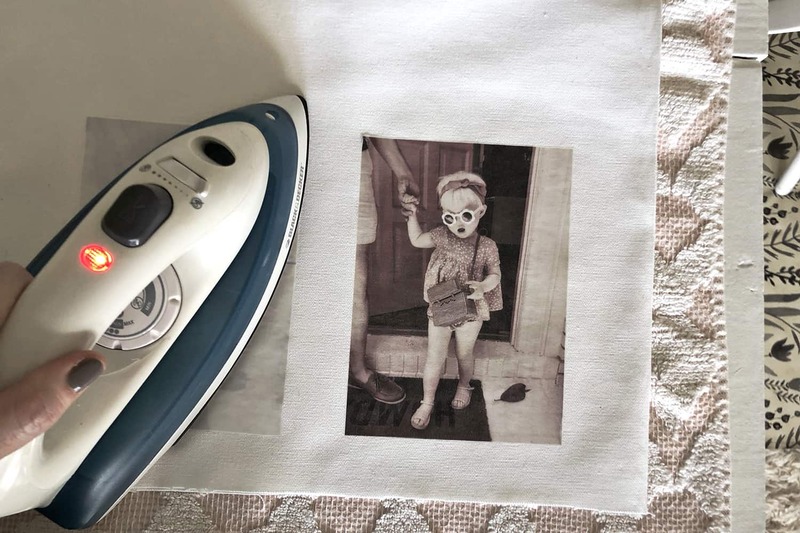 I was thinking that you could also print the photos on canvas with a larger border and then just cut the pages out of the canvas itself–that way you wouldn’t have to do the extra step of gluing the photos to the felt. And you could still have the super cute felt cover! That is amazing, I am TOTALLY doing this as a gift for my kids! I have a girl and two boys and would love to include all three in the book, they would get such a kick out of it! What type of canvas are you ironing the photo onto? Uhhhhhhhh I’m making one for me!!! I apologize, I’m a craft novice. I’d love to create this sweet little book for my niece, but could you provide more info on the canvas that was used? I went to Michael’s and the only canvas I found were canvas tote bags or aprons. Would amazon be my best bet? Thanks! ok this is the cutest thing i’ve ever seen for lil ones. how amazing! i would cherish this so much if i had one for my mabel and winter. thank you for sharing your skillz with us! i can’t wait to hear more about your newest angel babe!!! !